Built by our own highly skilled in-house team, and installed by our own highly skilled fitters. 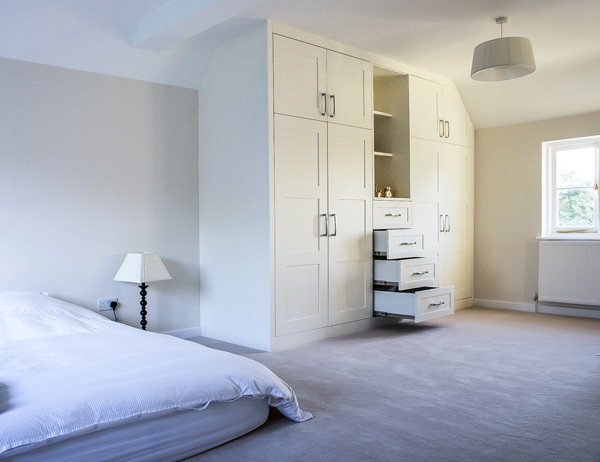 We specialise in creating quality personalised Built In and Fitted Furniture that optimise space in a functional, adaptable and elegant design delivered to a high quality and within a competitive price. 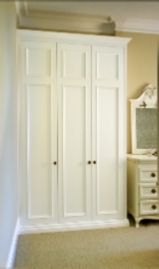 Built in Alcove wardrobes that have been designed to make full use of the alcoves in your bedroom. Created in a range of different designs, they can add style and an elegant touch and complement your bedroom. The design of your Fitted alcove wardrobes can be made in range of styles from ornate such as Victorian styles or in a shaker style. 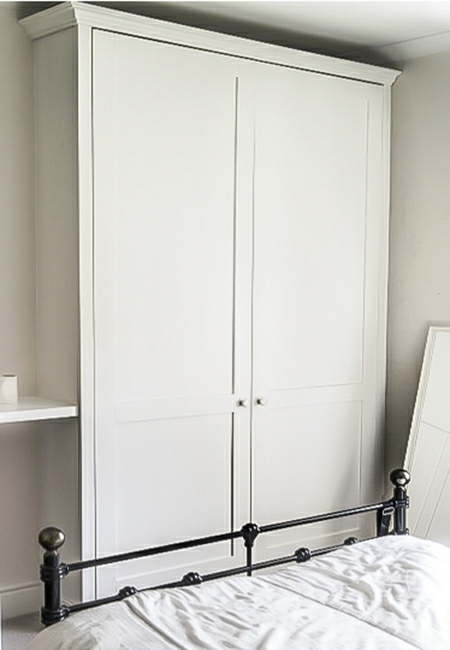 White painted alcove wardrobes or in a different colour will add depth to your room, and with a range of wardrobe internals to choose from, you will have all the room you need for your clothes and bedroom storage. 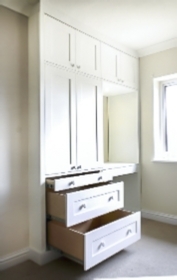 For added storage a large external facing drawer adds an eye catching addition to aid usability.If you have high ceilings, consider overhead cupboards for additional storage. 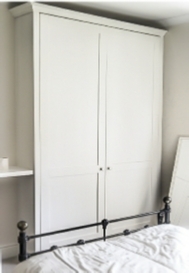 Built in alcove wardrobe in a small bedroom. 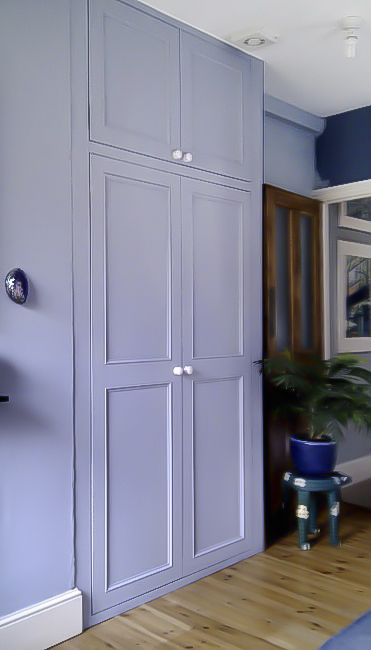 Topped with cornice to finish, a small space to ceiling stops this room from being too closed off. 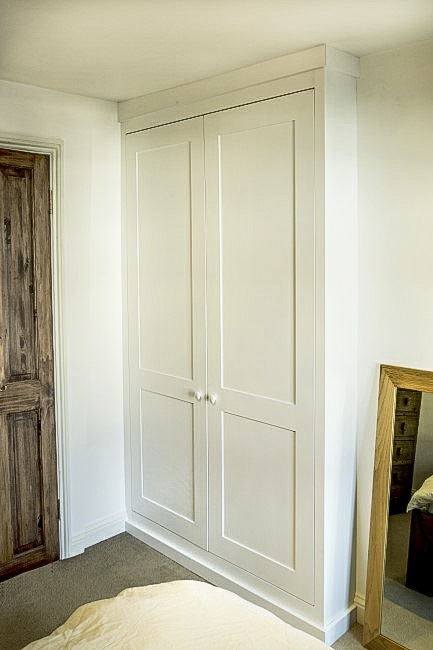 Tucked in to an alcove this built Alcove wardrobe fits perfectly in to this room. Fitted with a drawer unit and dressing table in this large alcove, the overhead cupboards providing extra storage space. 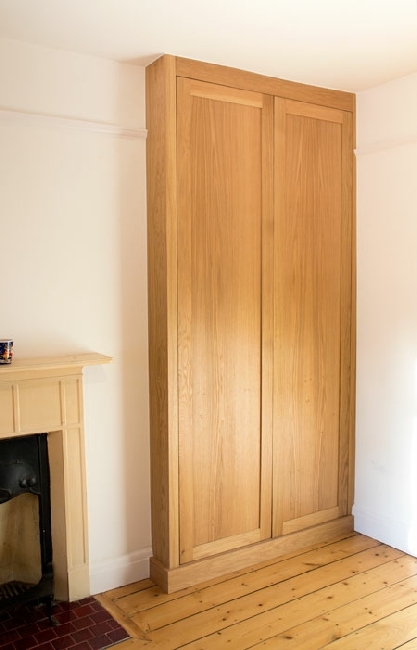 Large alcove fitted with a wardrobe under sloping ceiling with drawer unit . An Alcove Wardrobe built in Oak, Its modern panelled doors lead to a large storage area with a height shelf and hanging rail. 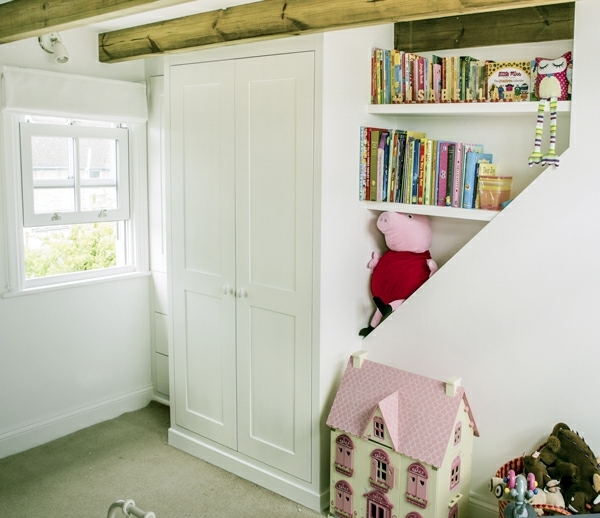 Fitted in to a alcove in a newly created loft room, with shelves in remaining space for extra storage. 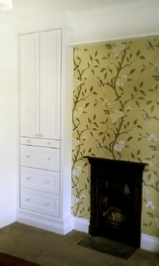 Fitted in to an alcove in the corner of the room. This modern designed wardrobe blends seamlessly in to the space. 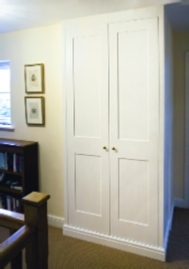 Wardrobe fitted flush to the font of this alcove with a set of drawers below cupboards. A narrow alcove was fitted with this wardrobe with lots of drawers and upper cupboards in a ornate style, with crystal knobs. 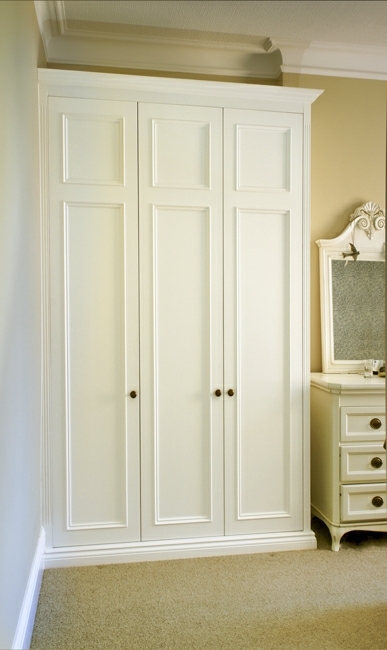 A grand styled fitted alcove wardrobe with large beaded panelled doors and large crown cornice. 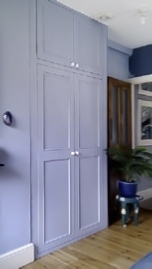 We can also spray paint your furniture with any of the above paints, or alternatively in an extra hard lacquer to provide a lifetime of use in any range or sheen levels, from eggshell to gloss and is available in any colour. Finishing is carried out in our workshop prior to each piece been fitted to your home, meaning your furniture will be ready sooner with less disruption. 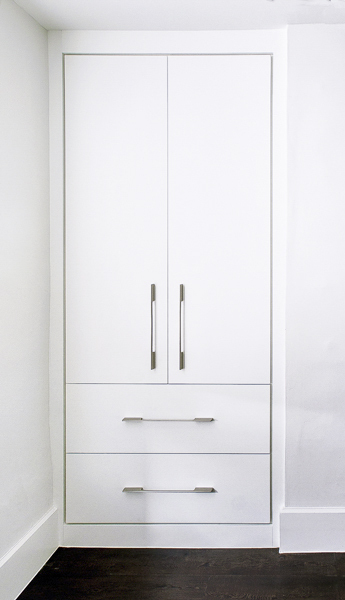 Every bookcase that we create for your home is made with the best quality material and professionally finished and installed. 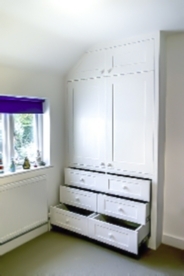 What you should look for is a reputable company with good reviews that will make the furniture and complete most of the finishing off site in their workshop where the quality can be controlled and is not dependent on having to finish, pack away and tidy up before time to go home. 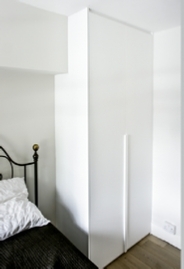 Houses shift and move a little over time, so generally speaking, the older your home the more likely the walls will be uneven. So in terms of measuring of your bookcases, the width of the wall will be different all around, the same applies for taking measurements at floor level and ceiling level, meaning that you will have to select a company with skilled craftsmen to take account of all this to trim all the panels to fit perfectly. There are so many on the job carpenters and companies with a wide variation in the quality they provide, typically most 'companies' are on the job carpenters that will typically spend the best part of a week to start making your alcove wardrobes by cutting up all the material, probably in your beautiful garden, followed by allot of drilling and screwing to assemble the pieces and then sanding, usually in the room the fitted units are to be fitted. After this the Alcove Wardrobes will require painting, which will require 2 coats of primer, and then two coats of paint, oh and not to forget to mention, sanding down between each coat (more rubbing down and sanding of edges if MDF is used) so a good finish can be achieved, allot of disturbance.